Coude Catheters from UTI Medical of OhioUTI Medical, Inc. Intermittent Coude Catheters have the same application philosophy as intermittent straight catheters but with a different design. A coude catheter has a slightly bent or curved tip which is about 1/8 of an inch. Intermittent coude catheters can be used with either male or female patients. They come in a wide variety of sizes and materials (latex, silicone, red rubber, and antibacterial). This type of catheter can be especially useful for those male patients that have an enlarged prostate. With an enlarged prostate, there is increased pressure on the urethra which can make insertion of a straight catheter more difficult. Therefore, the bent or curved tip of an intermittent coude catheter can make the insertion process much easier. Coude intermittent catheters can also be used for female patients who have urethral blockage or a narrowing of the urethra. A well-designed one will have a slight ridge on the opposite end of the catheter, the part you hold, so you can align it facing upwards so the tip is positioned correctly. 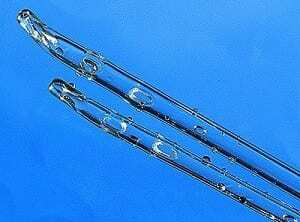 Like the straight catheter, hygiene and cleanliness are paramount to successful use and minimizing the risk of inflammation, scarring of the urethra, and urinary tract infections. Contact UTI Medical today for a personal consultation and to purchase your coude catheters.